Upstairs in the living area with its luxurious furnishings your eyes will be drawn to the view which encompasses one of the best 180 degree vista's in the Snowy Mountains. You cannot help but gaze out over 25klms to the northern reaches of beautiful Lake Jindabyne. To the left are Australia's highest mountains rising out of the Lake to the ski resorts of Thredbo and Perisher Valley. Adjoining the living area on the upper floor is your fully appointed kitchen, outfitted with high-end appliances including a built-in refrigerator and gas stove. We have provided you with the little things to make your holiday easy like slow cookers and rice cooker if you wish to eat in. The formal dining area is situated in the open space between the kitchen and lounge room, where a brand new sofa invites you to enjoy a movie after a day in the mountains on your flat screen television. There is free WiFi with this property. Four comfortable bedrooms, one with their own en-suite, provide the perfect accommodations for large families or friends traveling together. The large family bathroom has a spa to relax those muscles. You are supplied with high thread count bed linen and extra large bath sheets with an extra one for ladies to dry their hair. Bathrooms are also have eco friendly bath products supplied. Although you’ll feel miles away, you’re just a short 5 minute drive to the best restaurants, shops and galleries of Jindabyne. You can browse the ski shops and book a tour or lessons in both winter or summer months. Vehicles are accommodated in the direct access, double garage and ski or bike storage. There is no parking for mini buses at the property. Nearest parking up to 1 klm walk away. We are sorry there is No parking available for mini buses. Property suited all our needs with the best views in town and close to the Jindabyne Brewery! Very friendly and helpful in every way. Great experience all the way from pre-booking to check out. Thanks guy! Perfect location, gorgeous house. We were delighted with the place, it was great to come back from a big day on the snow and relax in the cosy living room upstairs. Very good service! Thanks for providing the additional fans. 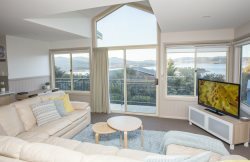 Excellent stay overall, good house (great view), well located, Jindabyne is a great summer holiday destination! Peter Was a great host and communication was excellent. Thanks for the lovely experience. This place is the Bomb. Such and amazing view and well equipped property. Highly recommend this for the ultimate stay in Jindabyne. Joan, Peter and their team are professional, friendly and knowledgeable. Joan and Peter went above and beyond to ensure our holiday was not a nightmare when the owner withdraw our original apartment 1 week before we travelled. Joan discussed options with us and arranged alternate accommodation quickly which was fantastic an far exceeded our expectations. The team then ensured that the transition was effortless and stress free. The Snow Escape Ray White team are amazing! Absolutely loved Whistler 6, the view of Lake Jindabyne is breathtaking. The apartment is well equipped and maintained which provided a fantastic home away from home for our ski holiday. Loved the heated floors and the layout of the apartment. It was convenience to shops and restaurants whilst being in a quiet location. Lovely accommodation overlooking Jindabyne lake. Absolutely loved the apartment! Its perfect for a family holiday/retreat. It was nice having a common area where all the kids and adults could spend time bonding. They really took care of little things such as providing board games and info guides. The home was well insulated and incredibly comfortable.Amazing place! Can't wait to be back! Deposit is required with booking, final & full payment is required 60 days before arrival date or your booking may be canceled as an unpaid booking and could be re-booked by another guest. You will receive emails before this happens so please ensure that your email address is correct at all times.